In our role of the spooked cameraman, there’s just enough light to highlight our confinement -- but not enough to highlight the dangers. 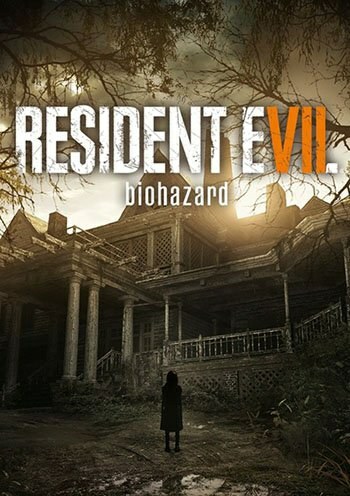 Resident Evil 7: Biohazard contains a strong grindhouse aesthetic, but I’d hesitate to call it a grindhouse game because it’s actually more stylistically complicated than that. It absolutely does evoke grindhouse in its violence, but its exploration, atmosphere, and puzzles are inspired by a very tonally different kind of horror: found footage. It seems like an obvious comparison, given the fact that one sequence has you literally playing as the cameraman for a TV show, but the inspirations go deeper than this kind of obvious imitation. First, though, it’s worth highlighting that those obvious imitations are good for the game. You can find three unique VHS tapes over the course of the game (there’s a fourth, but it’s story related), and each one plays to the found footage presentation in a different, clever way. The first has you playing the cameraman for a docu-style Ghost Hunters show. The hosts of the show are previewing the Baker farmhouse, ensuring it’s creepy enough to make for good television. As you explore they often turn to talk to you, acknowledging the man behind the camera, and the whole sequence has a grainy filter over it to mimic the camcorder being held. Like all good found footage horror movies, it generates tension through atmosphere and the anticipation of violence, rather than through action and explicit violence. There’s a moment when one of the hosts takes center stage, and when the two of you turn around the other host is gone. It’s a moment that happens in every found footage horror movie -- the sudden disappearance of a character -- and the game mimics it perfectly, using tried and true gameplay conventions to draw our eye toward one direction while the host disappears in the other. The second video revolves around another typical scenario in found footage horror: the chase. The camerawoman is being hunted by the crazed matriarch of the Baker family, and true to form there are plenty of close calls, like the camera ducking behind a shelf and watching through a crack in the wood, and plenty of shaky-cam escapes. The third video is rather prescient in its content: a found footage version of Saw, a combination of the grindhouse and found footage styles, in game form. The notable thing about these obvious inspirations is that the game is dedicated to this found footage style even in the face of its own illogic. We view all these scenes on VHS tapes, but only the first can logically come from an actual tape. The second is filmed on a smartphone, and the third doesn’t really explain itself but we can assume it’s some kind of GoPro camera strapped to a guy’s head. The fourth and final tape breaks the logic of the format: it’s a long, combat-heavy scene that makes us wonder how we’re holding a camera; then at the end of it, we record a message and see ourselves reflected in the webcam… and there’s no camera. It’s moments like this that make the game such fun. Horror isn’t a particularly logical genre, its emotional, and Resident Evil 7 takes that to heart, putting you in situations that feel scary even if they don’t make total sense. The game "knows" that it doesn’t matter how this footage was filmed and how it’s watched, what matters is that it all makes emotional sense, which is to say that everything works to evoke the same emotion, which is to say that everything is consistently scary. Filming with the grainy camcorder highlights the amateurishness of the ghost hunters, making them more vulnerable to any real horrors they find. Filming with a smartphone feels like an appropriately desperate attempt to record a warning message. The GoPro scene works as a meta moment in that you’re forced to play a game that seems designed to kill you. As for the whole nonsensical premise of viewing these moments on VHS tapes, well, that works because VHS is now an old enough video format that its low-fi look has become inherently creepy -- the static bands, the white noise, the blurry video, the scratchy sound -- in the age of high definition only ghosts use standard definition. Not to mention the symbolism behind the VHS: an old video format on an old farm, both left behind by the rest of the world. This premise, and all of its corresponding scenes, make enough sense on their own that it doesn’t really matter if they make sense together. The found footage aesthetic also extends beyond these very literal scenes of footage that has been found. It involves little tricks of the presentation that make the game itself feels like a found-footage horror movie. One trick is the lighting, specifically Ethan’s flashlight. It’s a strong beam up close, nicely illuminating shelves and items, but take just a few steps back and the light dims considerably. It’s awful at lighting up large rooms, we always feel like we’re standing on the edge of a deep precipice. It’s also awful in hallways, dimly lighting up the walls on either side of us, but the center of the beam is too weak to penetrate the darkness dead ahead, so we end up staring into an abyss, forced to walk right into it. There’s just enough light to highlight our confinement, but not enough to highlight the dangers. However, the biggest trick of the game lies in the players themselves. We are, by nature, curious about the virtual world around us, and Resident Evil 7 encourages further curiosity by hiding items in every corner, so we end up turning and spinning and swiveling the camera everywhere in order to get the best view of things. In other words, we move like someone holding a camera. When playing first person games we never move like or act like real people, we’ve always moved like someone holding a camera because that’s literally what we are. In this case, it’s less a matter of Resident Evil 7 mimicking the found footage style, and more a matter of it playing into the preexisting similarities between found footage horror and first person gaming. There are also several callouts to found footage horror movies, but that may just be me looking too closely at things, symbolism through pareidolia. Moments like in the first VHS tape, where you go into a basement and find your friend standing against a wall, like at the end of The Blair Witch Project. Or how the attic in the beginning feels reminiscent of the attic at the end of [REC]. Resident Evil 7: Biohazard makes us aware of our role -- and our limitations -- as the cameraman. Pop artist Madeleine Besson calls back to soul's golden era with her passionate, empowering new single about rising above stagnancy and toxicity. Indie folk artist, John Shakespear's latest is an autobiographical tale expressing what we would do for love as time progresses and we grow older.